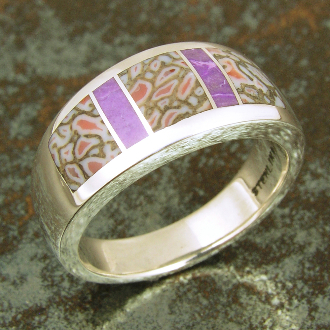 Handmade sterling silver ring inlaid with sugilite and dinosaur bone. The ring is inlaid with 3 pieces of unique gem dinosaur bone and 2 pieces of lavender sugilite. The dinosaur bone inlay has a gray base color with black or dark gray webbing and splashes of mauve or pale purple. This Utah dinosaur gem bone came from the Colorado Plateau and was a living animal during the Jurassic Period around 144 to 208 million years ago. The ring measures 8.5mm wide at the top and the ring photographed is a size 6 1/4 for scale. This ring will be made to order in your size in approximately 4 to 6 weeks. Select your size in drop down menu.